Today we are kicking off a two part series on thermal conductivity and how to use this property to choose thermal materials. Thermal conductivity is important since it can help you make the best choice of material for a thermal interface materials. silicone are often the default choices but are there are other choices based on the metals ability to transfer heat? There are indeed, but first, let's level set on what thermal conductivity is. In the thermal management of microelectronics, the interface material layer between a chip and heat spreader presents the single largest barrier to heat flow in the packaging of high-power dissipation devices. The selection of a suitable material to fill the interface between a chip and a heat spreader is critical to the performance and reliability of the semiconductor device. Thermal impedance is the single most important specification measured in degrees Kin2/W. Thermal impedance is an application-specific measure of the ratio of the temperature difference between two mating surfaces to the steady state heat flow through them. Thermal impedance usually decreases with added mounting pressure and contact area, but increases with the thickness of the TIM. Thermal conductivity, in W/mK, measures a material’s ability to conduct heat regardless of its thickness. A bulk measurement, thermal conductivity values can be used for comparing TIMs, but it does not describe a TIM’s ability to minimize contact resistance in an application. The gap space between the heat source and the heat spreader. As a rule, the thinner the TIM the better, but because mating surfaces are never perfectly flat, a minimum material thickness may be needed to accommodate non-flatness issues. Surface flatness of mating surfaces is important for determining the type of material. If both surfaces are flat, grease or thin films would be ideal choices, but that is seldom the case. Plastic IC’s are typically concave in the center and if the heat sink is extremely flat, the contact area would be limited to the periphery leaving an air pocket in the center. Electrical isolation, measured in kV, is sometimes needed. Silicone-based TIMs provide this property, along with thicker materials such as gap fillers. Thinner phase change materials and , greases may not be reliable electrical insulators. Graphite is electrically conductive. Compressibility is important when working with irregular surface as when covering a number of components. If heat and excess pressure are applied to a silicone-based TIM, silicone can escape and migrate along the PCB. Without sufficient pressure there may be excess thermal resistance across the interface. Temperature range in the interface determines which materials can be used. Silicone TIMS, e.g. gap fillers are rated to higher temperatures than silicone free interface materials. UL flame class rating. A UL flammability rating requirement is needed for many TIM applications. Most of these materials are available with V-0 ratings, which will meet most needs. Silicone or silicone free. Silicone is an excellent thermal material with a high temperature range but some applications, e.g. in space, can’t use it due to outgassing. Ease of application. The method of attachment is a cost and performance decision. Most small heat sinks are attached with a double sided thermal adhesive tape. Larger heat sinks require mounting hardware. Adhesives can be added to both or one side of the thermal material. However, with a layer of adhesive, thermal impedance will be increased. Utility. How easy are the materials to work with in a manufacturing environment? How easy are they to re-work when heat sinks must be removed? Some gap fillers can be re-used, but phase change materials and grease must be replaced. The long-term stability of the material depends on such factors as the usage temperature, time, application and material properties. 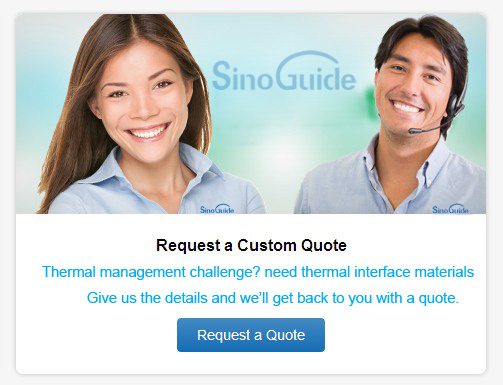 Want more information you can contact us or feed back, we provide professional thermal management solutions. All recommendations, statements and technical data herein are based on tests we believe to be reliable and correct, but accuracy and completeness of said tests are not guaranteed and are not to be construed as warranty, either expressed or applied. User shall rely on his own information and tests to determine suitability of the product for the intended use, and the user assumes all risk and liability resulting from the use of this product. Manufacturer's sole responsibility shall be to replace that portion of product of the manufacturer proves to be defective. Manufacturer shall not be liable to the buyer or any third party for injury, loss or damage directly or indirectly resulting from the use of, or inability to use, the product. Recommendations or statements other than those contained in a written agreement signed by an officer of the manufacturer shall not be binding by the manufacturer. ◎Welcome to participate in the discussion, please post your views here, to share your point of view. (such as CPU or chip) and into the heat sink. Copyright © 2004-2017 Thermal Interface Materials Global Site All Rights Reserved.